Perhaps it’s just my ignorance on the subject but these seem like the most pointless thing ever to me. What are they for? The only use I can determine for walking or hiking poles is as a means of defence against a would be attacker, especially in an urban area. What possible benefit can they provide? I can just about see some logic to using them while hiking up a mountain, they could feasibly reduce stress on the knees but walking around a flat city? Here’s the thing. We spent millions of years moving away from walking on all fours because it was safer and more efficient to do so. Now it seems that some people essentially want to go back to walking on all fours. That seems a step backwards to me. If anyone reading actually does walk with trekking poles, especially in urban areas, please do provide some rationale in the comments box. On the hills they definitely reduce the stress on the knees, particular, in my experience, on steep descents. On the flat, not something I've tried, they're used to provide something of an upper body exercise. 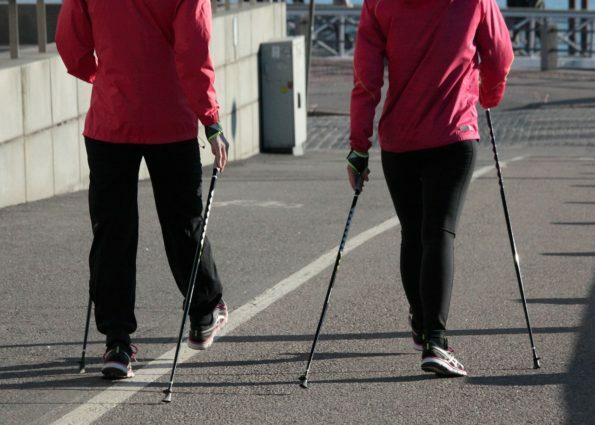 Read up on nordic walking for more details. Yeah, I'm not too bothered about them when used on hills, though there are still going to be downsides from what I have read. It's walking around a city on concrete that I just don't get.